I want to share my impressions of QSC16 conference, where recently I had pleasure to attend. This yearly conference is held in Munich for ten years already. I was there before only one time, in 2012. It made a great impression and this year was no worse. First of all, I should write some words about the conference itself. 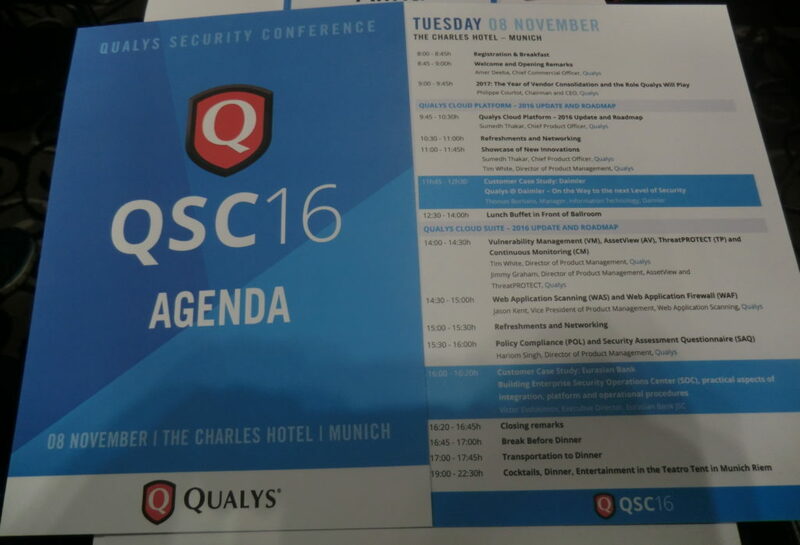 QSC is an acronym for Qualys Security Conference. It is clear from the name that it is fully dedicated to Qualys products. Who might be interested in such event? 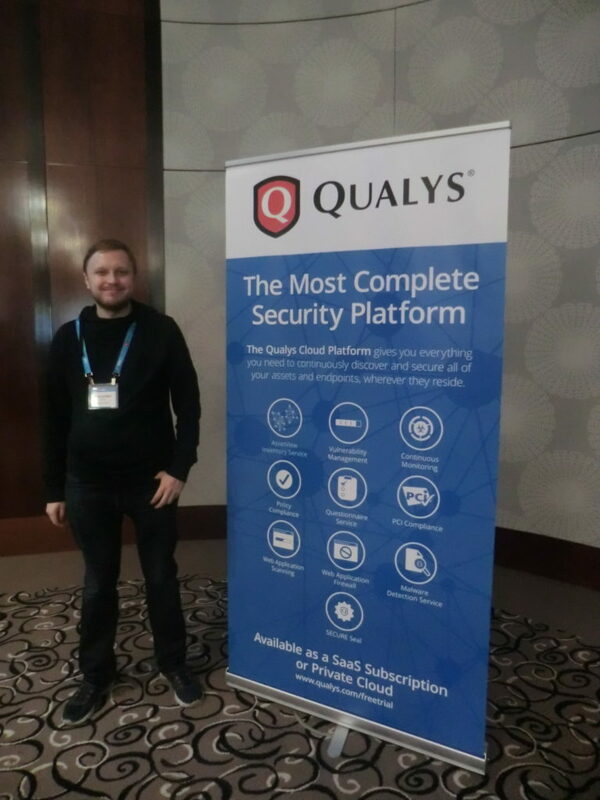 Mainly, of course, current and potential users of Qualys products, partners, competitors (from own experience, they are not welcomed there ;-)) and, I think it is the smallest group, analysts of Vulnerability Management market and Vulnerability Assessment geeks, like me. For people, who are sincerely interested in VM market changes, road show of the global VM vendor with the biggest market share (is it right, Gartner?) is a precious information source. Here you can learn about real experiences in the use of Qualys products and hear about the company’s future plans. Why is this event important? Despite existing skepticism about mono-vendor conferences and roadshows, QSC is one of the few events in Europe dedicated to the VM, in the broad sense of the term, almost exclusively. All discussions are, of course, in the context of Qualys solutions and you won’t hear any real critics of the vendor, however questions raised there are relevant for the entire VM market. This entry was posted in Compliance Management, Events, Vulnerability Management and tagged CIS, Elasticsearch, Maxpatrol, MPX, Nexpose, Positive Technologies, PT SIEM, Qualys, Qualys AssetView, Qualys Cloud Suite, Qualys FIM, Qualys IOC, Qualys ThreatPROTECT, Rapid7, SIEM, Tenable on November 13, 2016 by Alexander Leonov. 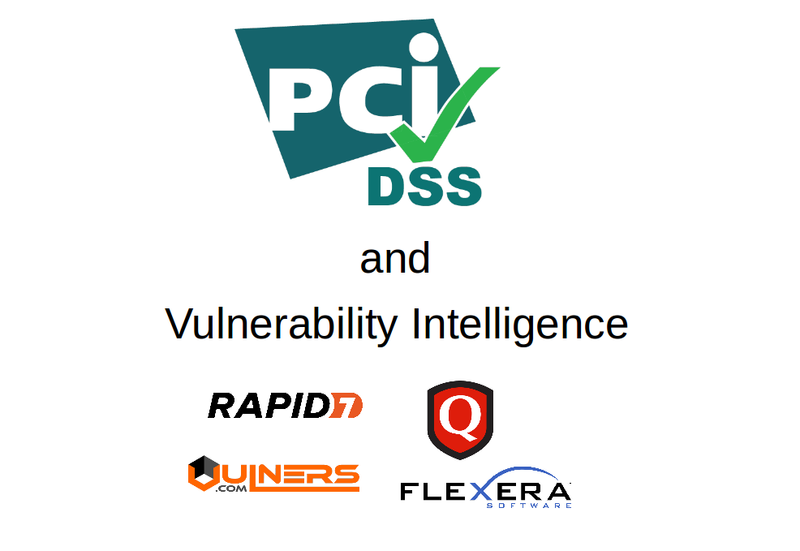 Establish a process to identify security vulnerabilities, using reputable outside sources for security vulnerability information… It’s one of the requirements of PCI DSS v3.2 (The Payment Card Industry Data Security Standard). It’s not about regular scans, as you could think. It is actually about monitoring web-sites and mailing lists where information about vulnerabilities is published. It’s very similar to what Vulnerability Intelligence systems have to do, isn’t it? A great opportunity for me to speculate about this class of products and deal with related PCI requirement. 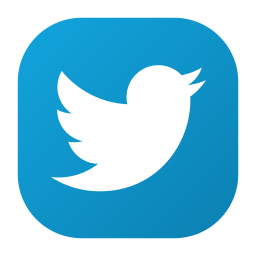 In this post I will mention following solutions: Flexera VIM, Rapid7 Nexpose NOW, Vulners.com and Qualys ThreatPROTECT. 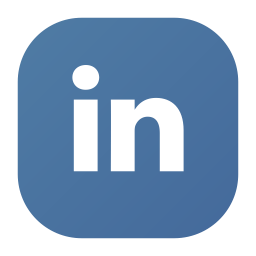 Term “Vulnerability Intelligence” is almost exclusively used by only one security company – Secunia, or how it is called now Flexera Software. But I like this term more than “Threat Intelligence”, a term that many VM vendor use, but historically it is more about traffic and network attacks. Let’s see how Vulnerability Intelligence solutions was developed, and how they can be used (including requirements of PCI Compliance). 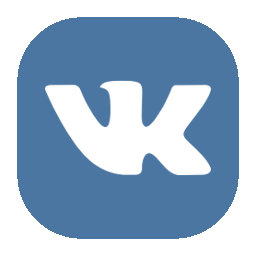 This entry was posted in Standard, Vulnerability Database, Vulnerability Management and tagged Flexera VIM, Microsoft SCIM, Nexpose, Qualys, Qualys ThreatPROTECT, Rapid7, Secunia, vulners.com on July 7, 2016 by Alexander Leonov.